This is a good follow up to Yingjie’s previous post about the upcoming Immersive Learning Institute for 2019. 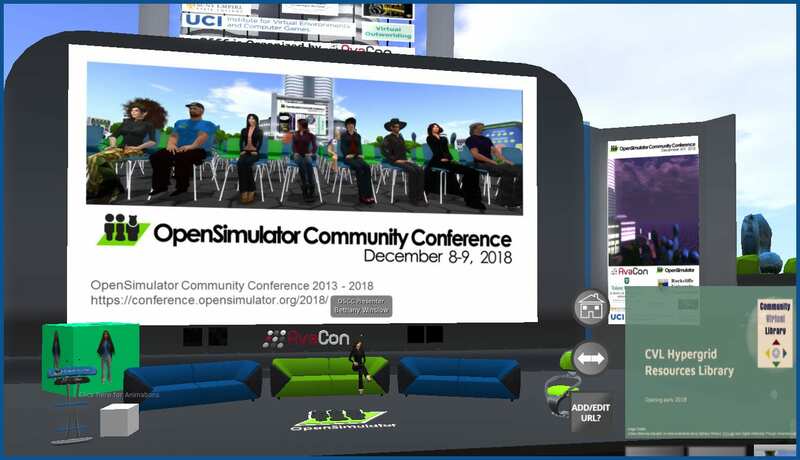 As I wrap up my thoughts on my conference experiences for this year, I’m most delighted that I was able to attend the sixth annual OpenSimulator Community Conference 2018 on December 8th and 9th. 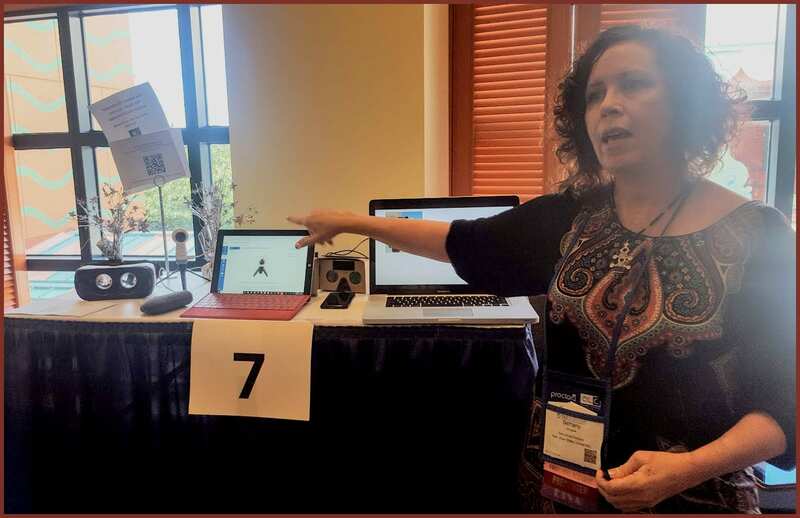 This was my second year attending this virtual world conference, and it allowed me to network with educators, artists, and others from around the world, all of whom are passionate about this open source alternative to a virtual worlds platform such as Second Life. This was also my first time presenting in a virtual world! Originally I was to co-present with a colleague, Dr. Valerie Hill, the director of the Community Virtual Library (CVL). 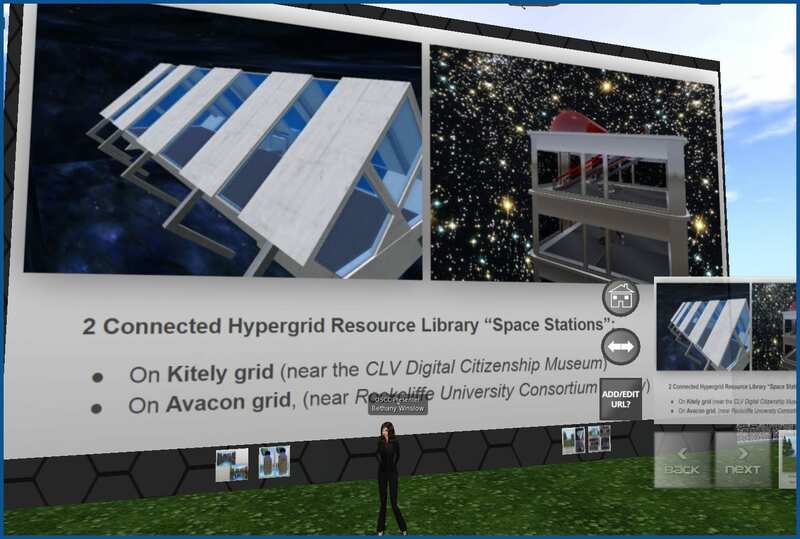 Valerie wasn’t able to attend, however, so it gave me the opportunity to introduce myself to this community, and tell them about CVL’s plans for a hypergrid resource library on two different virtual worlds that are using the OpenSimulator platform. As the project lead, my presentation included screenshots of the two buildings I’ve put in place where all our content and resources will be housed, along with the portals that allow for visitors to jump easily from one virtual world grid to another. Since the concept of hypergridding is likely to not be familiar to you, here’s a simple explanation. There are many virtual worlds built on OpenSimulator, and those worlds can be on anybody’s computer or server anywhere in the world. So if virtual worlds are like 3 dimensional websites, hypergridding is the protocol that allows a user to jump from “website” to “website”. Instead of just navigating the different pages of one virtual world, a visitor is empowered to travel from different computers or servers to another. 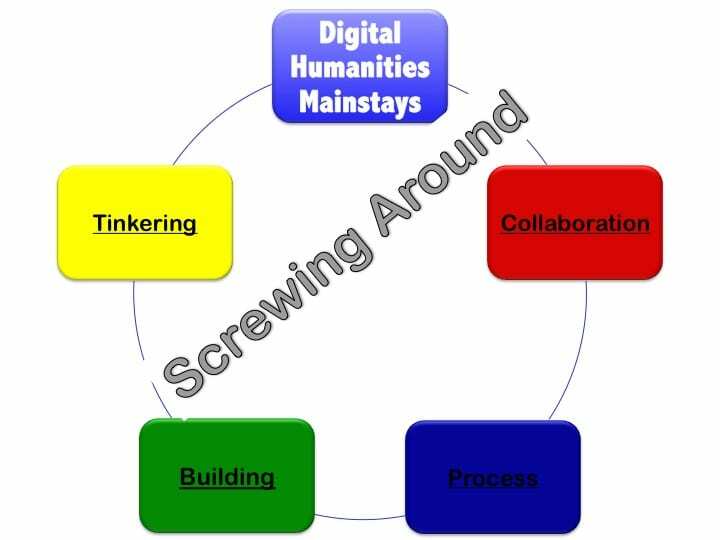 While there is a bit of a learning curve, and the technology is still kind of wonky, I think of open source virtual worlds and hypergridding as kind of a 2.0 mashup of the internet and social media. It’s every sci-fi geek’s dream – the emerging metaverse! As I’ve mentioned in a previous post, winter is generally a good time for eCampus staff to focus on their own professional development. 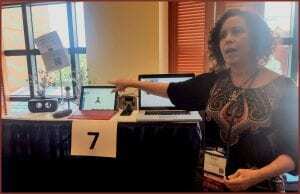 I was delighted to be able to attend the Online Learning Consortium’s Accelerate 2018 Conference in Orlando, Florida. This was my first time at this enormous national convention and it was a whirlwind of learning and networking! There were over 500 presenters, and I was fortunate to be among those chosen to do a table-top interactive presentation. My topic was on Integrating 360 Content with Instruction, and for 45 minutes I went through some of the basic concepts, terminology, possibilities and pitfalls of using Canvas to share 360 content. I had several mobile devices, two tablets, a couple Samsung phones, a Samsung 360 gear camera, and two Samsung Gear360 headsets along with a Google Cardboard, so that participants could view 360 content in multiple ways. I also created a public Canvas course, Integrating 360 with Instruction!, participants could access via a QR code or bit.ly link so that participants could see how the content could be presented in Canvas. In particular, I strongly encouraged them to visit the course on multiple devices, just like their students would, to really get a feel for the challenges and opportunities this kind of technology presents. I also attended many excellent lectures and discussions with my peers from all over the country. I took a lot of notes that I shared with my eCampus team, and I look forward to sharing what I’ve learned with faculty! Winter for eCampus staff is a great time to catch up on our own professional development, and earlier this month I had the opportunity to attend this conference in San Francisco with a variety of participants who are involved using virtual worlds in education. One the best things about this conference was the smaller size compared to other ones I’ve attended. It was interactive too, we use a conference app to communicate and a communal Padlet for reflection on the sessions. Basically, it was like a two day breakout session with passionate and creative educational professionals, and I got to meet and network with old friends and new! I was delighted to be able to finally meet (in-person) my mentor and the Director of the Community Virtual Library, Dr. Valerie Hill. I also got to meet the CVL’s Co-Director, Alyce Dunavant-Jones who just graduated from SJSU’s MLIS program that is also connected with CVL. (In fact, Alyce also posted about the event at the SJSU School of Information blog.) I met Val and Alyce last year at the OpenSim Community Conference and I’m delighted to be co-presenting with Val for the same conference next week! In addition to learning from a variety of different sessions, I loved getting to know some of the amazing instructional design team from University of Texas Rio Grande Valley. I also got the chance to meet and extensively mingle with the leadership of Rockcliffe University Consortium who sponsor many of the conferences related to virtual worlds and education. As with Valerie and Alyce, some of these people I’ve met in-world at one event or another, and meeting in-person was just like meeting an old friend! I also met Renne Emiko Brock who teaches multimedia studies at Peninsula College in Washington and we immediately “clicked”. She has worked with Valerie before, and I’ve seen her present in-world on several occasions. I immediately recognized her because she looks the same as her avatar! 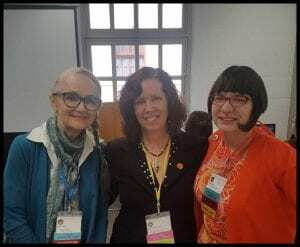 Before the group dinner together on the second night, Renne, Val, and I began talking about me making a visit to Washington this summer to visit both of them, and for the three of us to co-present on our overlapping projects at one or more conferences in 2019. So here’s to the authenticity of in-world relationships, and some exciting times ahead in virtual worlds and education!